Somalilandsun-For decades it has been one of the world's most fragile regions, plagued by armed conflict, poverty and periodic droughts. But in the 1990s, the Horn of Africa, comprising the states of Somalia, Eritrea, Ethiopia and Djibouti, became the focus of a somewhat surprising investor: DP World, a global port operator that is majority owned by the government of Dubai, part of the United Arab Emirates (UAE). From its headquarters in Dubai's sprawling port of Jebel Ali, the maritime company and its Emirati owners saw in the Horn of Africa what many others didn't: an area of vast economic potential and geostrategic importance. In 2006, DP World won a contract to build the Doraleh container terminal in Djibouti, now the small nation's biggest employer and source of revenue. Years later, in 2016, it signed a $442-million agreement with Somalia's secessionist region of Somaliland, to manage and invest in the deep-sea port of Berbera. Both decisions proved prescient. In recent years, Saudi Arabia and the UAE have become active in ports and military bases in Djibouti, Eritrea and Somalia, while Qatar and Turkey, who align with Saudi Arabia's regional rival Iran, are building in the Somali capital, Mogadishu, and the Red Sea port of Suakin, off the coast of Sudan. 'We are seeing a race between regional and global players to take advantage of big opportunities located in the region,' says Camille Lons, programme co-ordinator at the European Council on Foreign Relations. One reason for this scramble is commercial. The Horn of Africa is strategically located next to one of the world's busiest sea lanes, with access to both the Red Sea and Indian Ocean. Every day around five million barrels of crude and petroleum products flow through the Bab el-Mandeb Strait, a neck of water bordered by Eritrea and Djibouti. 'It is one of most trafficked shipping lanes in the world ,' says Olivier Milland, a political risk analyst at Allan & Associates. 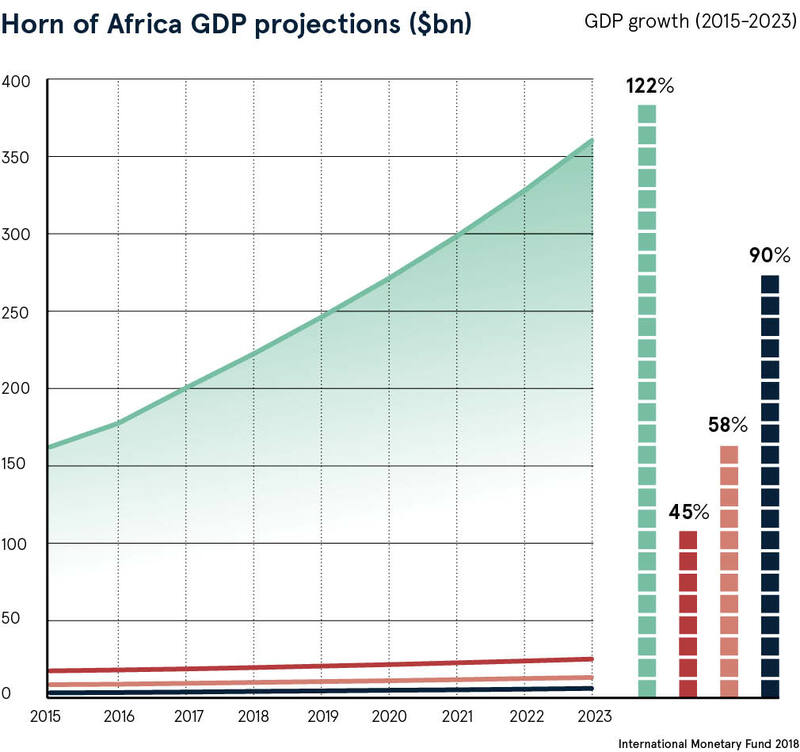 More ports and better infrastructure are also needed to handle growth in the Horn of Africa's largest economy, Ethiopia, which is predicted to expand by 8.5 per cent this year, but is landlocked and therefore heavily dependent on Djibouti. Since sweeping to power in April, Ethiopia's new, reform-minded prime minister Abiy Ahmed, 42, has made port development a key priority, calling for investments across the region. 'It is very important for Ethiopia to diversify its trading streams,' says Mr Milland. 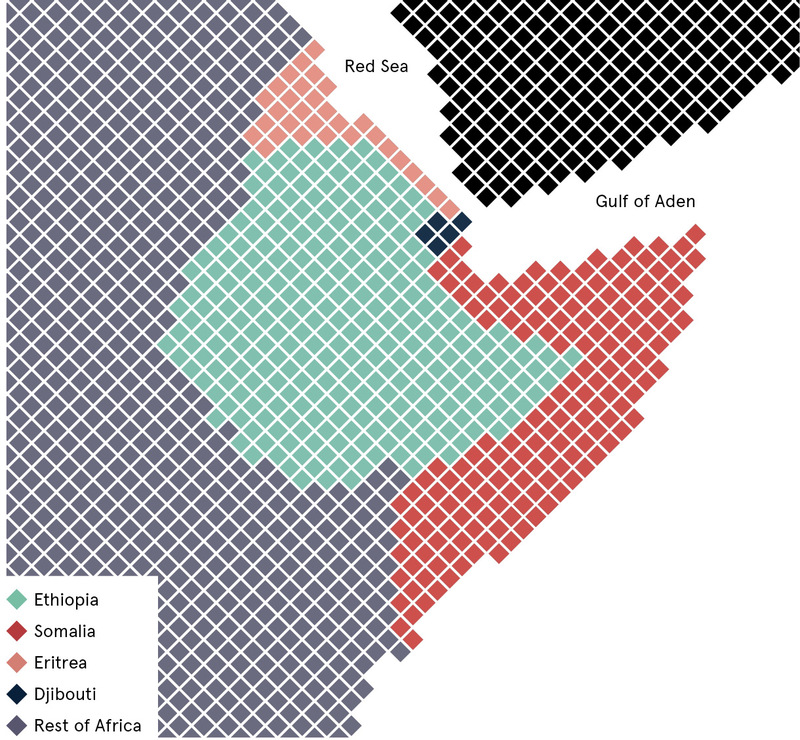 But Gulf interest in the Horn of Africa is also being driven by regional political rivalries, with different states seeking to secure strategic locations, especially in the context of the war in Yemen , where a military coalition led by Saudi Arabia and the UAE has been fighting Iranian-backed Houthi rebels since March 2015. Somalia's breakaway region of Somaliland, which is not internationally recognised as an independent country, also chose the side of Saudi Arabia and the UAE, while the central government in Mogadishu, which is closer to Qatar and Turkey, stayed neutral. Last year the UAE began constructing a military base in Berbera, which is 190km south of Yemen. 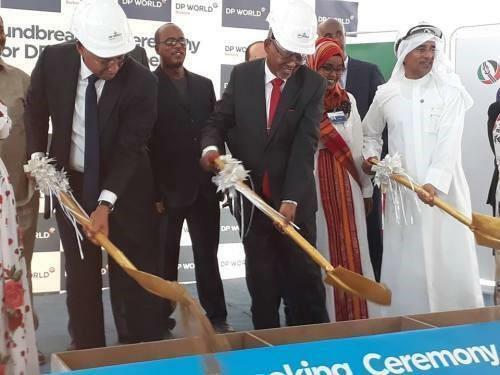 In March this year, DP World also finalised a contract with the Somaliland authorities to develop and operate Berbera's port, in which Ethiopia also has a 19 per cent stake. The venture has the potential to turn Somaliland into a regional maritime hub, but has prompted a furious response from Somalia's federal government which regards the region as part of its territory and says the secessionists have no right to sign international agreements. S'The deal has been perceived as a foreign intrusion by Mogadishu,' says Ms Lons. On March 12, Somalia's federal parliament took the step of banning DP World from operating in the country in a move Somaliland's president Muse Bihi Abdi referred to as a declaration of war. The crisis has since soured relations between Mogadishu and the UAE. In April, Somali security forces confiscated millions of 'undeclared' US dollars from a UAE plane landing in the capital. The UAE responded by ending a military training programme it was running in Somalia. With the UAE sidelined in Djibouti, analysts say other countries could step in and that Gulf nations aren't the only ones in the running. Some have speculated that the Djibouti government may hand over Doraleh to investors from China, which is currently building a naval base in the country. The involvement of China in the Horn of Africa's ports adds 'another dimension to an already complicated equation', says David Styan a lecturer in politics at Birkbeck, University of London. 'You have the largest Middle-Eastern maritime logistics shipper DP World in an implicit, forward-looking contest with another global shipping alliance, which includes the Chinese,' Dr Styan adds. But as different nations scramble for control of ports in the Horn of Africa, Mr Milland says it is worth remembering that the region is still prone to instability. Somalia is dealing with the threat of resilient al-Shabaab militants, Eritrea remains one of the world's most repressive countries, and even Ethiopia, considered relatively stable, is currently facing widespread ethnic violence and displacement.